Am I the only one who's not embarrassed to admit that I just watched The Amazing Spider-Man movie yesterday? Don't ask why it took me so long & it can be depressing just thinking about it. Now that I've FINALLY watched it before it leaves the cinema for good, here's my take on the movie. This version is a reboot from the previous Spider-Man franchise directed by Sam Raimi with slight deviation to the plot. 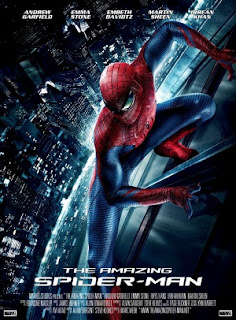 It is a tale of teenage Peter Parker - focusing on his family issues, relationship & how he became the wall-climbing superhero. So how did this movie starring Andrew Garfield fare against Tobey Maguire's portrayal of Peter Parker? Both did a great job in projecting the character in different age group effectively, I supposed as envisioned by the each director. Maguire & Garfield are both nerdy, which is good, just that the former seems to be more convincing at it because he's a natural dork (looks wise). Nevertheless, Garfield was fabulous being a shy & dorky but genius teenager despite his age at 27. I have no issues with the castings as they are all generally well suited for their role. The problem here is how the story unfolds. The movie tends to drag on unnecessarily in certain scenes especially on how Peter is fumbling in his words when being around his first high school sweetheart, Gwen. While it did make sense to capture those emotions which happen during teenage years, I found it rather tacky & unsophisticated to be related to teens nowadays. Correct me if I'm wrong...or maybe I'm too old for the teen crushes & what not. To begin with, why place emphasis on teen angst & the idea of growing up? The movie somehow became too emotional & dark which is not the essence of Spider-Man.